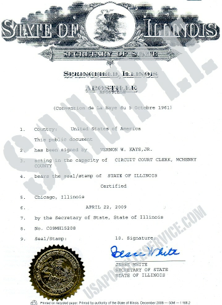 A notary cannot certify copies of documents or signatures. Out-of-state officials cannot be certified. Any document that has been notarized or certified must be submitted to the Secretary of State Index Department for apostille certification. All information on this page is derived from official sources. Birth certificate -- Must be a certified copy from the County Clerk, Local Registrar or Illinois Department of Public Health. Marriage license -- Must be a certified copy from the County Clerk. Divorce decree -- Must be a certified copy from the Circuit Clerk. 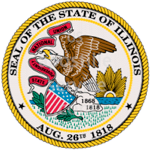 Documents other than those listed above must be notarized by an Illinois notary public.